One of the things that has struck me about Japanese boatbuilding is the degree to which during the construction of a boat the builder makes changes that deviate from the original drawing. All my teachers who used drawings worked from a 1/10th scale image. Scaling from that size is inaccurate, yet the drawings were just a starting point for them; during construction issues would come up with the material and changes would be made on the spot. 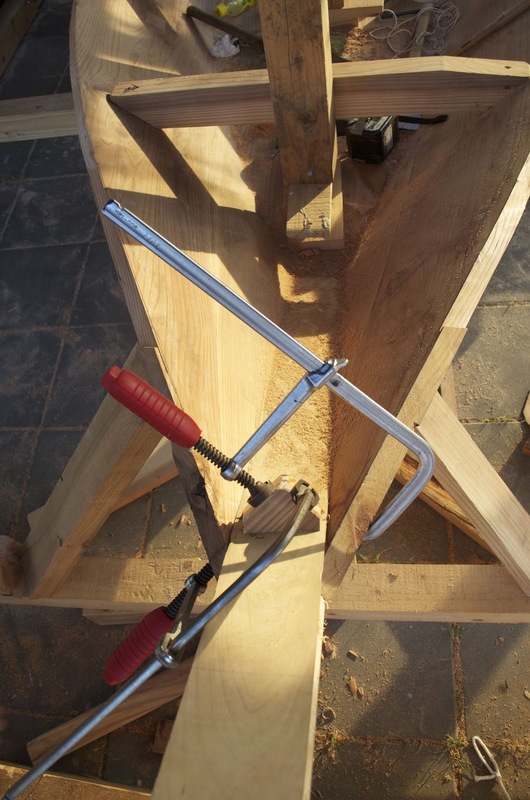 The process of sawing to fit planks can easily remove more than 1/4” of material. 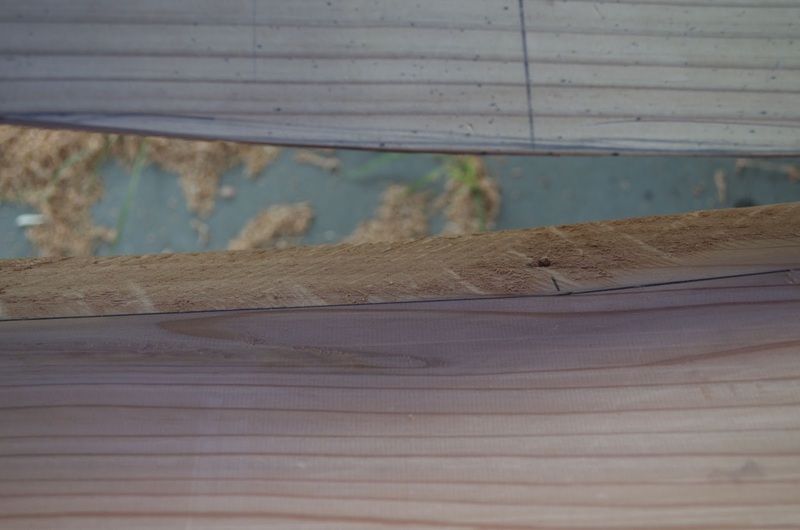 As a result the final boat could deviate considerably from the measurements first laid down on the wood. 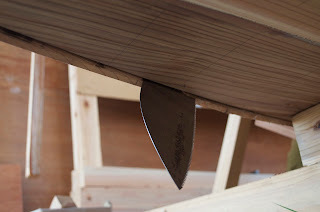 Photos here show my apprentice, Takumi Suzuki, fitting the kajiki with our handsaw, and then cutting the nail holes with a special chisel. In the West boats are generally built around moulds that define the shape exactly. If the builder is careful in building their mould from the lofting the boat should conform exactly to the plans. But Western boats are built of thinner and narrower planks for a given size than Japanese boats, and are much easier to force into a particular shape. The Japanese builder has to struggle to bend thick, wide planking, and it doesn’t always work out the way one might intend. In our boat I tried to keep the angle of the kajiki consistent with my lofted lines, but at the forward station (called in this region the habadokoro, literally “width place”) I just felt we were forcing the planks too much, so I let them stand a bit tall. 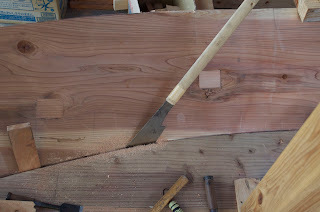 Our kajiki are probably 3/8” higher at the chine than designed. When we hung the second kajiki yesterday I tried to keep the planks at the same angle, but at the aft habadokoro the starboard kajiki stayed a bit low after we nailed it. I tried propping it higher but decided against putting too much strain on the plank and risking cracking it. I will try raising one plank and dropping the other and get them as close as possible. Again, I saw all my teachers basically abandon their drawings fairly early in the process, opting for sound construction techniques and overcoming unexpected issues. 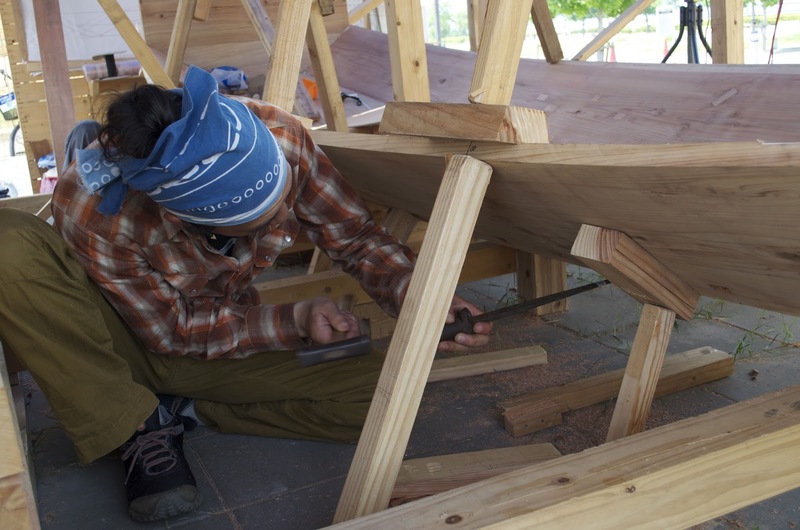 In this respect Japanese boatbuilding is very improvisational.